This is the first comprehensive guide to the workings of an industry of crucial importance to the world’s agricultural economy. Published in association with the International Fertilizer Industry Association, The fertilizer industry looks at the structure of the industry for all the key categories of fertilizer products including nitrogen, phosphate and potash fertilizers. It covers their production and end use, their implications for the environment and considers the patterns and future of the international trade. Part 1 Overview: Fertilizers and the environment; A brief history; Fertilizers in the world economy; Overview of manufacturing processes. Part 2 Production and consumption: Structure of the fertilizer industry; Nitrogen fertilizers; Phosphate fertilizers; Potash fertilizers. Part 3 International trade: From factory to farm; International trade; Future outlook. Murray Park has worked in the fertilizer business for over 25 years. He was educated at St John's College, Cambridge and the University of Manchester and holds master's degrees in agriculture and agricultural economics. 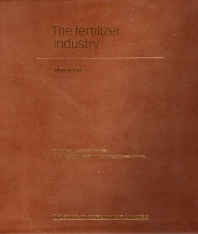 From 1972 to 1981 he carried out commodity market research for the purchasing department of Fisons Ltd – Fertilizer Division in Felixstowe, Suffolk, England. From 1981 to 1992 he was a senior consultant both with British Sulphur Corporation Ltd and British Sulphur Consultants based in London where he was involved in numerous research and consultancy studies worldwide. He is now an independent consultant and has recently worked on fertilizer market studies and related projects in Uzbekistan, China, Ethiopia, the Czech Republic, Romania and Poland. He is a member of The International Fertilizer Society.